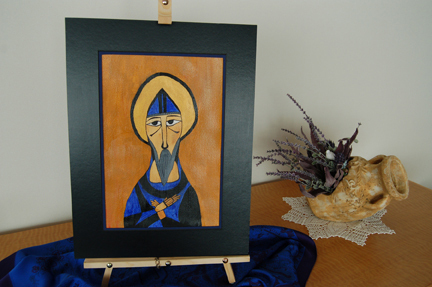 As Benedictines, the Sisters of Annunciation Monastery enjoy two feast days in honor of Saint Benedict. On March 21, we commemorate the Passing of Saint Benedict. The Universal Church celebrates Saint Benedict on July 11. The Rule of Benedict is a little 73 chapter book written by Saint Benedict to guide the lives of those wishing to follow his way. The first word in the Rule is “Listen”. Life has so much to teach us and we know that God speaks to us in a variety of ways. We need to listen and that can be challenging when the daily demands of school, work, family, and friends distract us. There are plenty of examples in Scripture about people listening to God, but I’ll just mention one, the story of the Annunciation. Mary was open to receiving God’s message from the angel Gabriel. Mary first responded with “How can this be? Why me?” With some time, whether it happened as quickly as it does in the Gospel of Luke or if she needed a bit longer to ponder the message, Mary’s response shifted to “Yes, let it be done to me according to your will.” Mary’s example of openness and willingness to follow God’s plan can guide us as we live our lives. As Benedictines, we listen for God in our daily lives. You never know how or through whom God will speak to you. Twenty-some years ago, I was a student at the University of Mary, intent on completing my biology teaching degree and becoming a high school science teacher. I attended a presentation by the Sisters of Annunciation Monastery and heard them share about their life, their calling, and the ways they serve others. I was open to receive God’s call to me through those sisters. I started to listen. Was God calling me to join these women? There were times when I had questions similar to the Virgin Mary – Why me? – but by the time graduation came, I was ready to answer, Yes, Lord, I will follow your plan and I started the process of joining the Sisters of Annunciation Monastery. As Benedictines, we have many opportunities to listen to God speaking to us. It may be during our morning, midday, and evening prayer in the chapel, in our daily celebration of the Eucharist, in our personal prayer and Lectio, in our interactions with each other, and in the guests who visit our monastery. Throughout our history, our sisters have listened to God’s call. We listened to the needs of the people of this region when we founded Mary College. We continue to listen to God’s call in these current times by founding new programs. Examples include the Benedictine Volunteers program, where live-in volunteers serve with us while discerning their callings, and Ministry on the Margins, a ministry that supports those who may fall through the cracks during times of transition and challenges in life. As we sisters have listened to God calling us to monastic life, I invite you to listen to the Divine Voice calling to you in this time and place.